for it is mine alone. It is more laundry room/mudroom redo time! I em doubly excited to share this with you all because I got to use something new. The wonderful people at Decal Guru contacted me and asked if I would be interested in using one of their decals. Um, yes please! 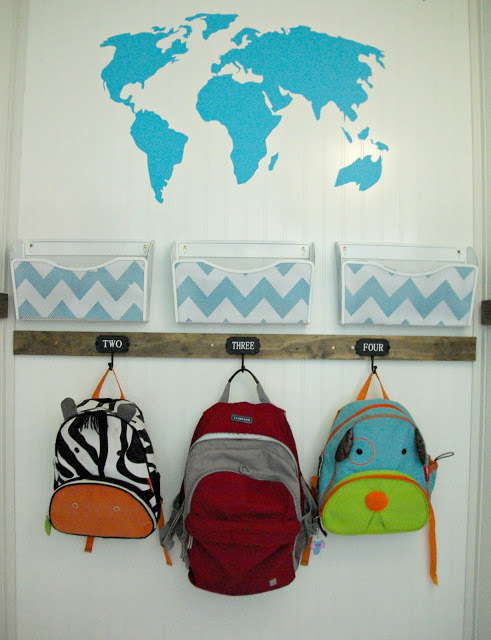 I kid you not, I was wanting to put some kind of wall art or decal in this spot above the back packs. As I was perusing their site to see what spoke to me, I saw this beauty! 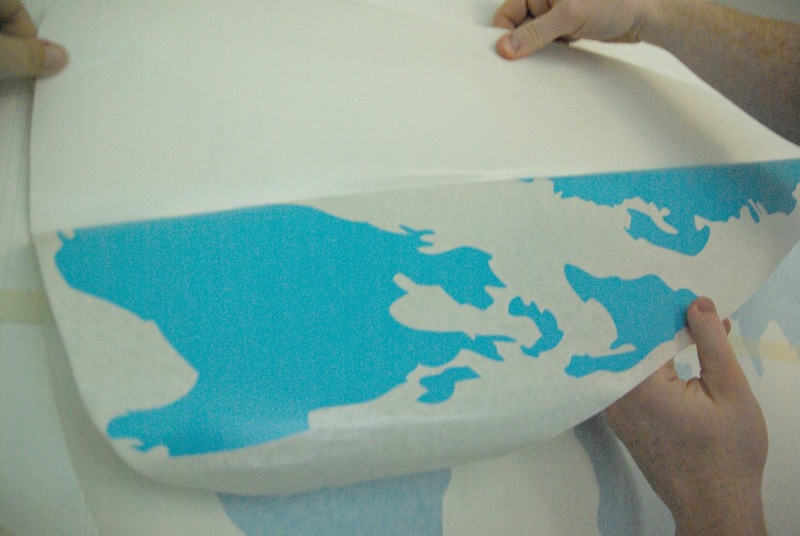 A world map decal, and with a color option called geyser blue. It seemed to match the turquoise I had already been rocking in here with the homework wall organizers. I was giddy with excitement when I saw this. It was exactly what I had been dreaming up for this space. The wall decal was shipped to me and came in a round container. So when it came out I had to lay it down flat over night to get it… well flat. In this case, the world is actually flat. Go figure! Here is the back of the decal. This is the instructions that came with it. Along with a plastic smoother tool. I was given all that was needed to get this job done. Well other than tape. You need tape for this as well. 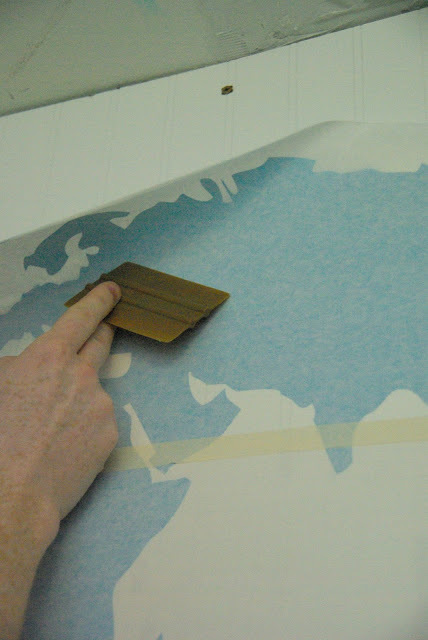 Place the decal with the back (contact like paper side) against the surface. Be sure to wipe the wall down, get any dust and dirt off of it. I am not saying your walls have dust and dirt on it. However mine do. So with a freshly wiped down wall, and one dirty rag put to good use. 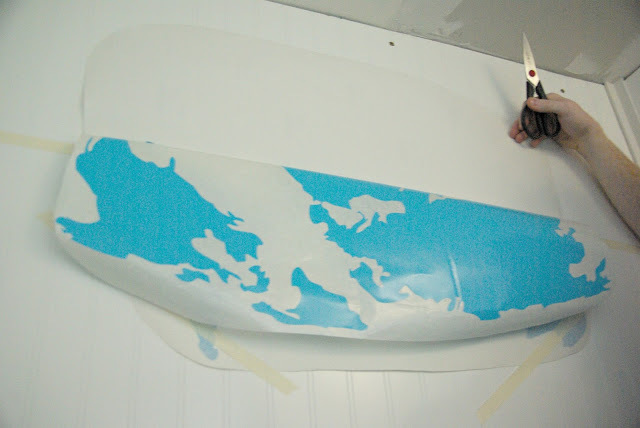 Take standard masking tape and line it up in the middle of the decal. I also had to tape down the top, strictly to take the picture for you all. It kept trying to fall down. 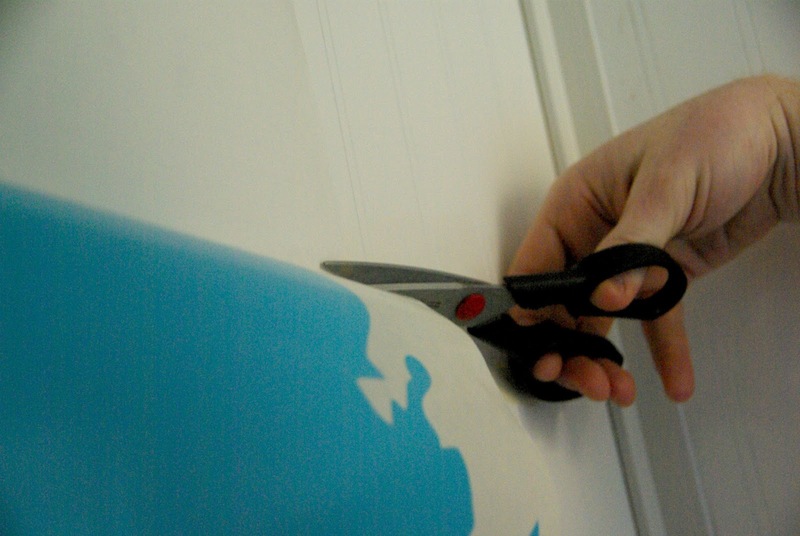 Pull one portion, either the top or the bottom of the decal away from the wall. 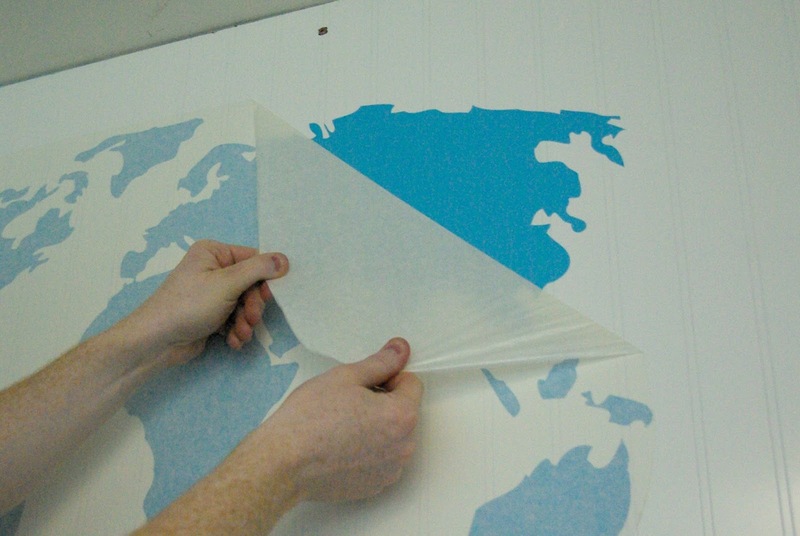 Begin to peel and separate the top portion of the decal from the wax paper in the back. I should also mention that I do not have odd manhands. I had to have Dale do this project, because apparently being 5’5 is still not tall enough to reach where this decal is. So the tall and over 6 foot man came to the rescue. He has the wonderfully freckled and manly hands for your viewing pleasure during the duration of this tutorial. As the decal was being pulled back I literally gasped. 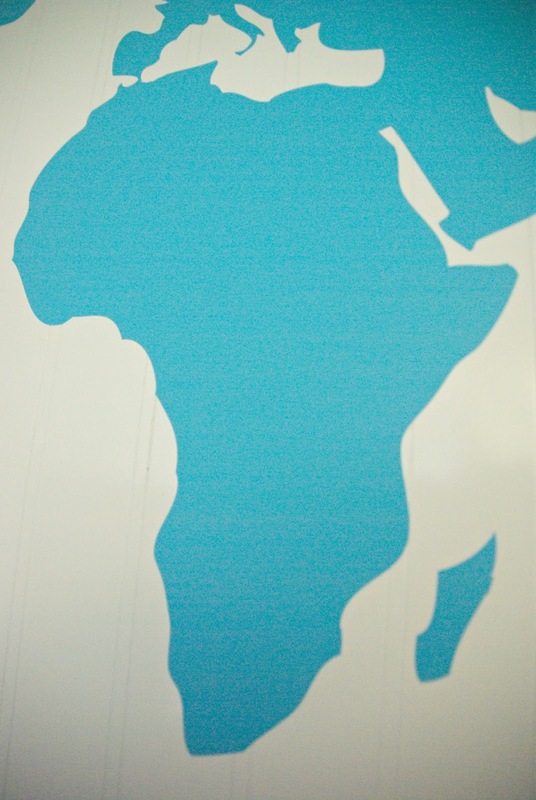 I got to see the bright and glorious blue hue that would be on my wall. I was eager to get this moving. 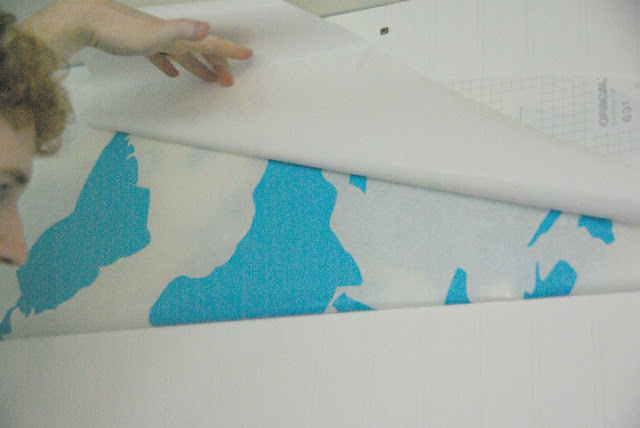 Once one half of the decal was pulled back away from the contact paper backing. Cut along the line. Separating the back from the front of the decal. Using the nifty tool that was given, run the smoother tool along the decal. Smoothing out any pockets, air bubbles, or lines. Going from one side to the other. This was really simple and easy. There was hardly any pressure needed. Once one portion was done, repeat the process with the other side. So in my case, peel the bottom portion off to separate the two again. 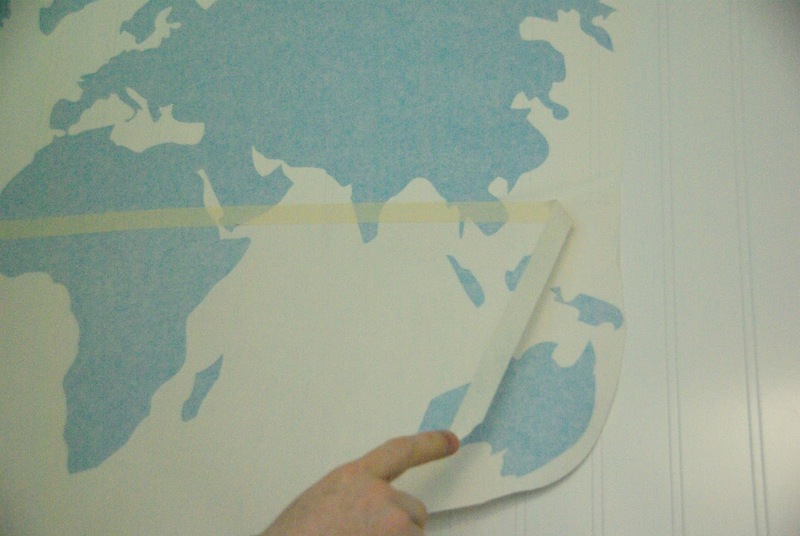 Once both sides have been separated from the backing, pull the tape off. 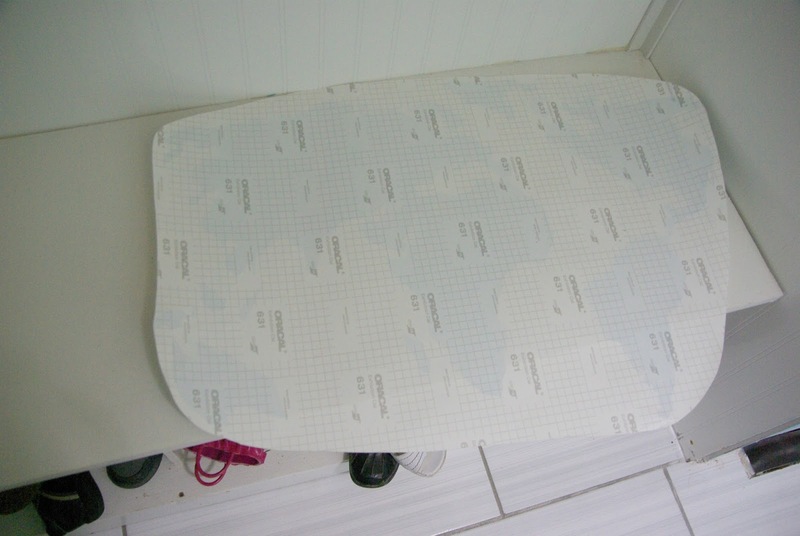 Using a damp cloth, wipe the decal down. This reminded me of applying temporary tattoo’s. It was the same process. I rock the temporary ones because I don’t have the guts to get a real one. I kid, I don’t have real or temporary tattoos, I am not cool enough. The truth is, I have three kid’s and temporary tattoo’s seem to be the go-to birthday party favor. I am sure you are all well versed in that process. The decal is bubble, air pocket free. And smooshed (professional decorating term) into the surface of the wall. 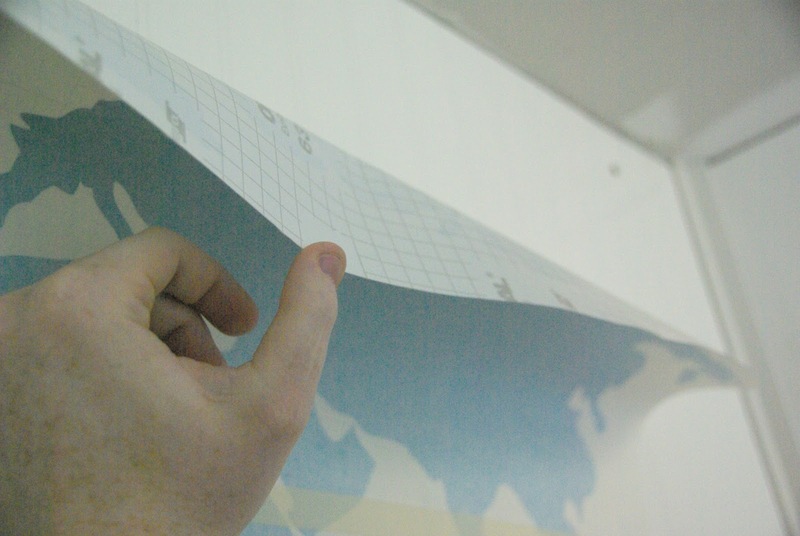 Pull back the top adhesive slowly. 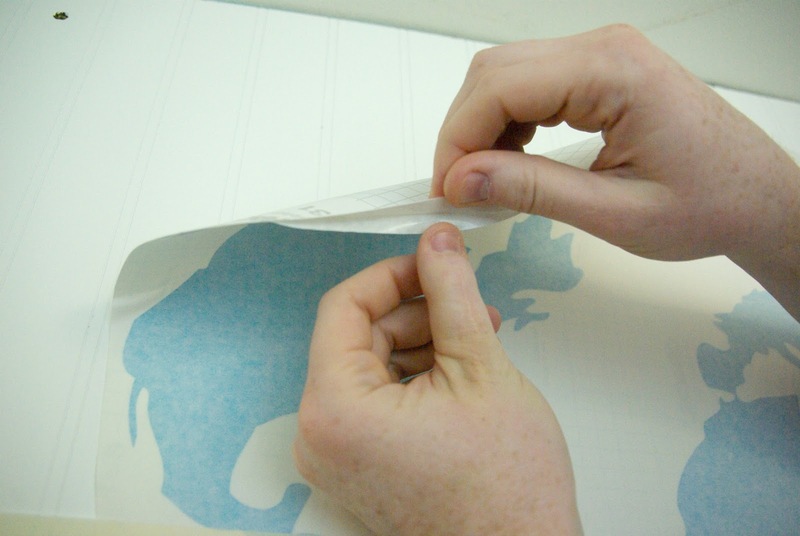 Because of the kind of decal I got that had many pieces to it; there was a few times Dale had to manually separate the decal from the paper. But, there was never any tearing or even threat of tear. Just go slow and pay attention to what you are doing. No quick ripping a band aide off kind of deal. That was it! I am somewhat of a decal rookie. I mean I have done them before. But, only the ones purchased from a store that were more like stickers. This was a legit decal. You can pick different sizes for the decals and many colors. For this particular world decal there were so many options in color’s. You can find this decal here. The color is perfection. So fun and vibrant. The decal is very smooth and does not have any peeling or possible peeling points on it. I feel like a world map decal is perfect for this space. This is the kids homework, back pack, and shoe space. They go to learn and get ready to greet the world here. I know I am reaching with the significance of it. But, this was what I had been thinking all along. I am not into a theme-like space, but the world fits perfect here. You can go to The Decal guru here to find a decal that might work for your home, computer or car. This organization station is chugging along nicely. Next week I will be spilling even more secrets of this space. There is still some big parts of this that I have kept under wraps. I would love to be able to also give you a update on the washer and dryer side of this room. But, it has not been touched since hanging the upper cabinets. Because… life. I don’t think I need to explain more. I hope I can get things moving along more. I have a to do list of things that resembles one of those cartoon old-timey scrolls that rolls down a hallway when opened. I just need to find the time, or way to speed up my movements like in Hollywood movies or those talented bloggers that show time lapse videos. I need that for real life. I would have soooo much to share! But, I am in reality, at normal human pace. Ugh, reality is no fun! This worked out perfectly! I love it! Thank you! It was so easy to put the decal on! Thank you Laura! The color is amazing on this decal! What a great decal. Looks wonderful with the organizers! It's adorable! I love the simplicity of it but how much of a statement it makes! Nice work! I love maps! I think I would use a us map for my wall. Now I have to hunt for one. What a great entryway. super cute! I am loving this map, and have been thinking about trying to find a large and older one with lots of colors. Putting that somewhere in my home would be amazing! If you are looking for a decal version The Decal Guru has a great option! This is a great addition to the space! Perfect spot for that decal. Great tutorial! Thank you! It was such a simple process, with beautiful results! Thank you, I am loving this decal too! Love this! I love using decals, especially since we are in a rental house right now. Thanks for the step-by-step instructions, I am very much a visual learner! Thanks for sharing! Decals for rentals are a great option! I am so happy you found the steps helpful. It was a really simple process to get the decal up. Such a cool decal! I've been trying to come up with something to add some interest above my son's bed and I think a decal like this would be perfect. 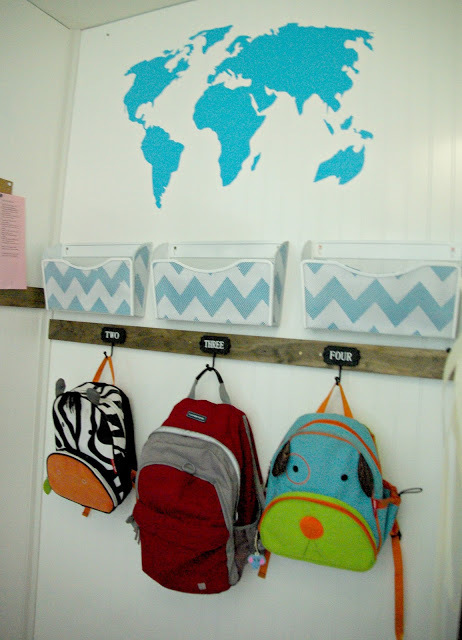 It looks great in your mudroom. That would look great in a kid's bedroom! Love this! The color is perfect and the kids will be learning without knowing it just by seeing it every day! I am in love with this color! I can help them learn without even realizing it, I like the sound of that! Congratulations!! That's really awesome. And I love the decal too. Thank you! It was great working with a great product, and even better that I got a great decal for my home! wow! That turned out really awesome! Look super simple to apply too!! Thank you! It was really simple to do, I was actually worried about how it would go but was pleasantly surprised! So cool! 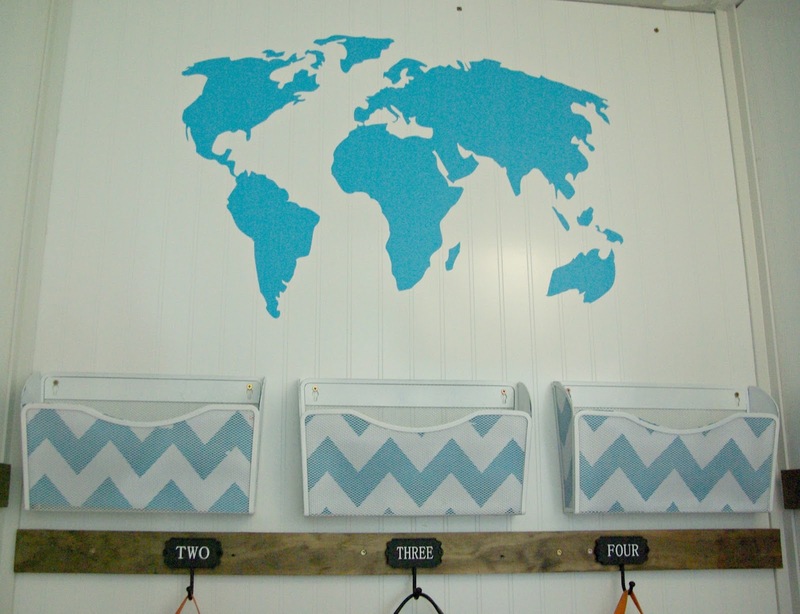 I love wall decals – this would be a great way to cover a large space in a kids bedroom, too! I am in love with them too! The nice thing about these decals is you can pick the size you need. SO going really big if needed is definitely a option. I love wall decals! They are all over my house! This one is pretty cool! This one is a great wall decal option. I love maps! This looks really awesome. As a bonus- having maps around the house helps kids to understand geography- a décor plus! I love this!! It turned out GREAT!! Thanks for giving clear and detailed instructions. Thank you! I am so happy you found the instructions helpful, I wanted to showcase just how simple it was. I love it. That would go really well in my library room. 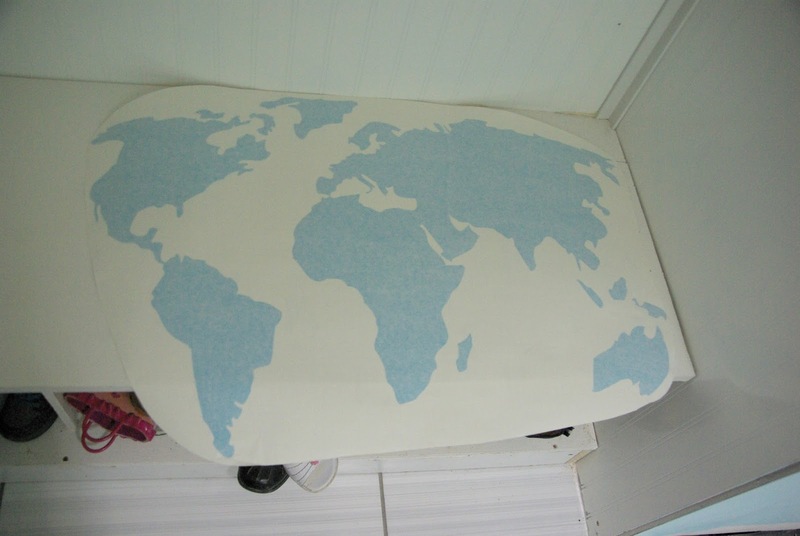 That would be a great location for a world map decal! Wow, you've been very busy! The kids would really appreciate this, and trust me, it does help in the geography department. My dad had a map put up (no decals back then!) when I was younger, and I became a country whiz in no time! This makes me so happy to know! 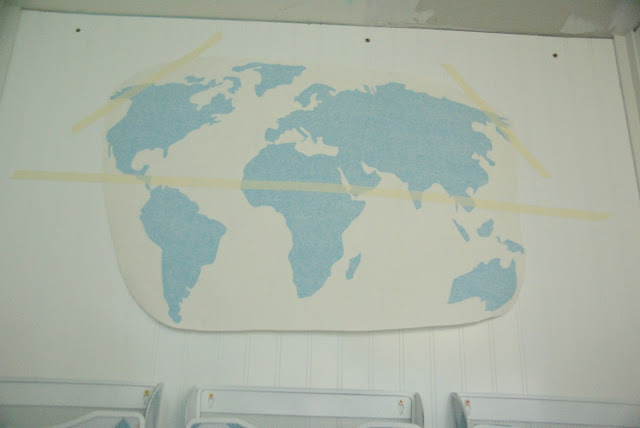 We have a globe sitting out and my kids are constantly asking about wherever they are pointing, we have had many conversations about geography or the people in that region from them just spinning the globe and then pointing. Also, most maps have such beautiful colors it is a decorators dream! This looks so easy. 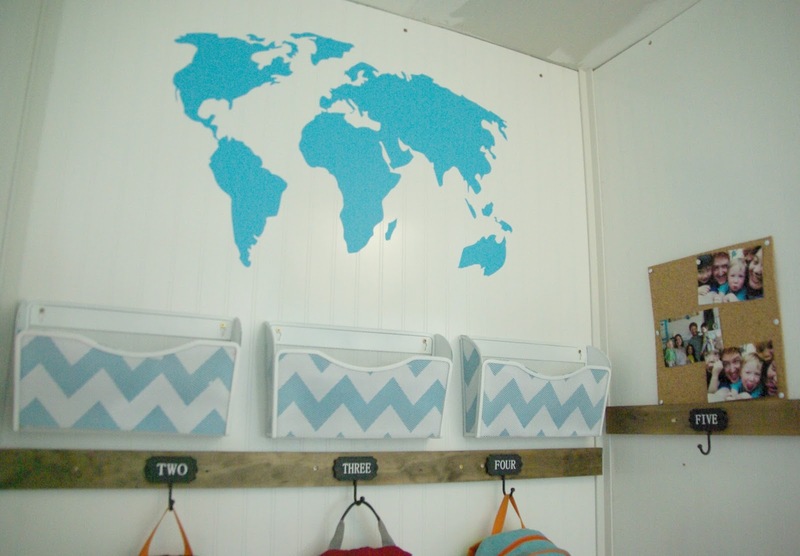 Would be perfect for my kids room! It was really simple and easy, a no fuss design project! 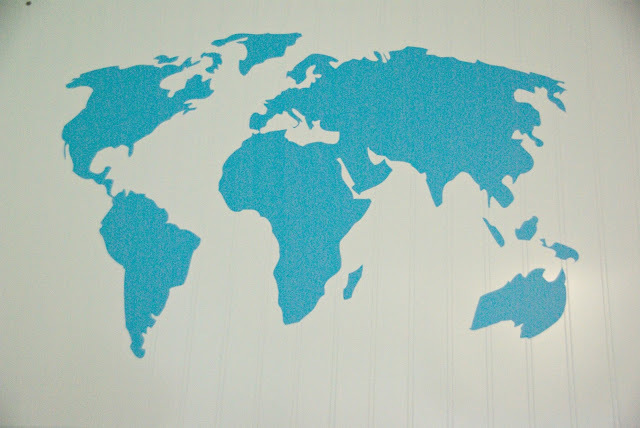 I love wall decals and I love maps so this is a perfect decal. Love that it's so easy to use also. I am in love with this decal! I am so happy you see how simple it was, I am all for simple home decorating projects! LOVE IT! 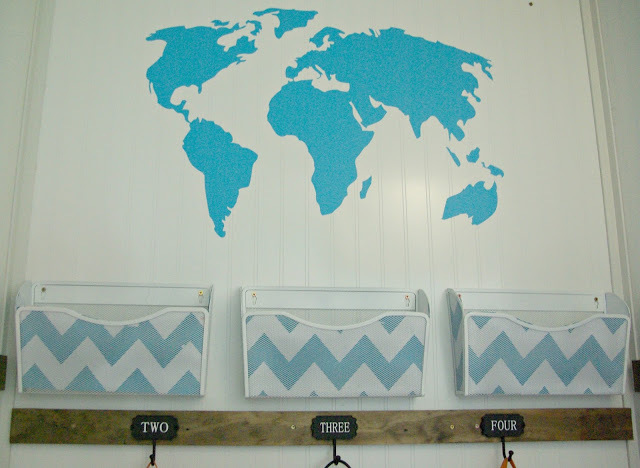 I have been wanting to incorporate more maps into my house. I love this decal!!! Thank you! 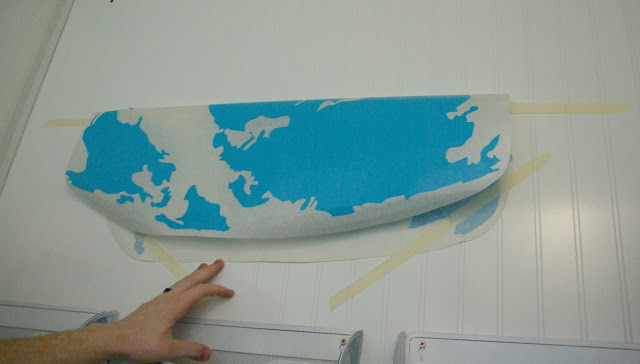 I am worried I will go map crazy in my home now. 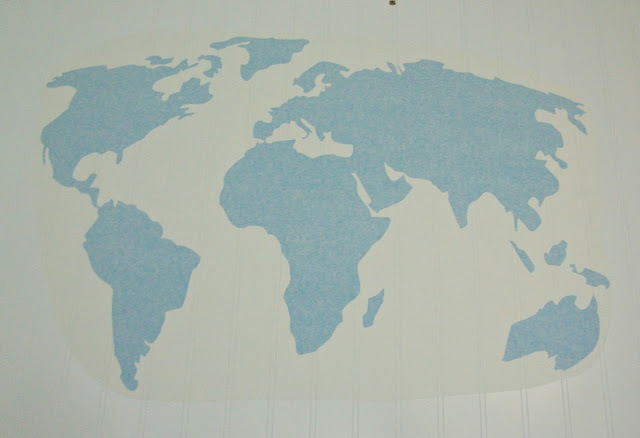 We already have a globe, now this decal. I have been wanting to put a large colorful world map in our stairway leading to the basement but don't want to overdo the world map trend. I love wall decals!! The blue on white looks so sharp and chic. Love it! This is really awesome, I love the whole wall!! Thank you! It is finally all coming together! 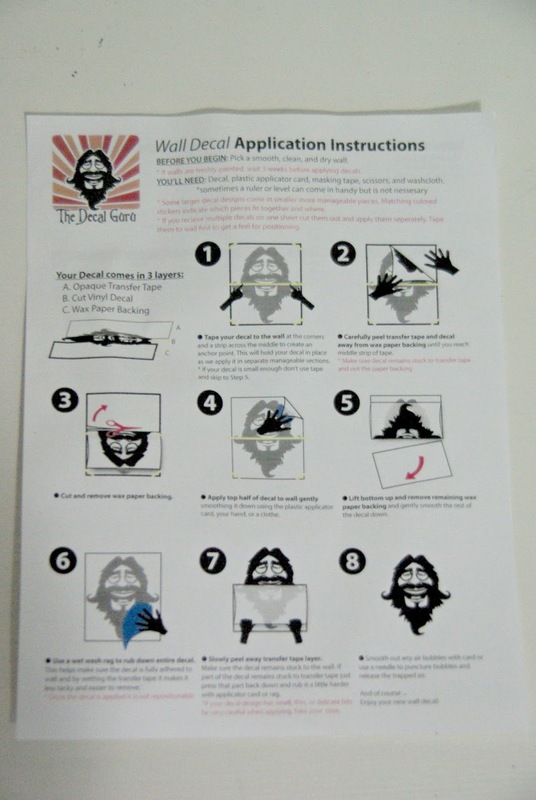 Oh wow – I have always wanted to put up a wall decal but have been too intimidated! When I look at instructions on the decal sites I feel even more intimidated because I know the demonstrator probably has lots of experience already and they can do multiple takes if they want to. Your pictures make it seem a lot less scary! I have a question about how the application process went for you. I noticed that the design used Oracal 631 vinyl, which is standard for these kinds of graphics. It’s what we use. 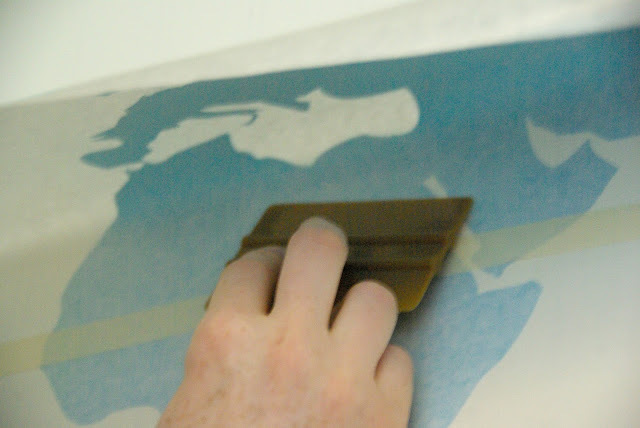 However, there are certain paints (VOC – volatile organic compound – paint or textured walls) that make it difficult for vinyl designs to stay attached to the wall. Have you had any trouble with this design since you put it up? By the way, if you would like to have us create a custom vinyl design for you to use in your home, please let me know. We’d be happy to make something for you if you’d be interested in blogging about the experience.